As summer winds down to an end and I can hear the school bells ringing in the distance (unless that’s just my mid-morning post-bike tummy rumbling again? ), I am reminded that I am still a marketing student and will soon have to return to the books. 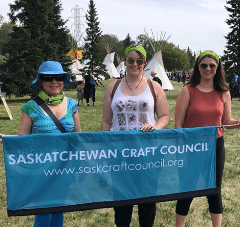 This also means I don’t have much more time with this community that I’ve been woven (or crocheted) into, the Saskatchewan Craft Council. This thought has made me a little sad, since I’ve gotten to know so many inspiring, creative, kind, hard-working and amazing people through my experience, but it has also given me opportunity to reflect on the great experiences and accomplishments that I’ve had in the past 3 months. Right from the start of my time at the SCC, I was greeted with kind words and was instantly regarded as part of the team. With not much experience working around Fine Craft, I was a little nervous to start, especially when surrounded with so many talented creators. 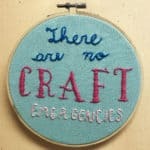 I would consider myself an experiential learner, so working within a field that is a little outside of my comfort zone had its own learning curve, but being encouraged to get involved in as many of the ongoing activities as I could helped me realize that there are no stupid questions, and no craft emergencies! (Thanks Sydney). 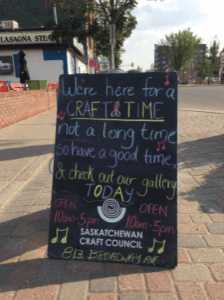 Working with the exhibitions summer student Lucas to think of puns for our chalk boards to set outside the building each day also warmed me up expressing my own creativity and dare I say – artistic ability? But this was just the start of my involvement in the crafty activities ahead! Some of the first activities I had the chance to be a part of were to represent the SCC’s values of inclusion and support within Saskatoon and the larger community. Some of these include celebrating pride by decorating the building on Broadway, as well as showing support and taking part in the Walk for Reconciliation. Not only were these positive initiatives, but they also helped me learn the importance of non-for-profits to show support and to be engaged in the community. I also had the pleasure to take part in the biennial EMMA Collaboration event and auction, which showcases exactly what it means co-operate with others and to be part of the Fine Craft community. Any competition, finding a competitive advantage that differentiates you. Specifically describing their demographic information; identifying what needs they have, the best way to reach them, and how you can best fulfill their need. After evaluating all target markets, identify the amount of resources that should be invested in each specific group. Evaluate the brand, developing a Big Idea, which drives all future marketing material and explains why we exist, who we are serving, and our value. The goals I created included specific areas of interest including: brand awareness, consumer beliefs, brand image, and increasing visitors and sales. Then it’s necessary to go back to the initial situational analysis evaluation, compare it to where you want to be, and research, evaluate, and determine the most effective ways to reach this. For example, some of my strategies included incorporating new elements in our advertising, including social media and web presence; physical building and atmosphere elements such as signage; creating an Integrated Marketing Plan for guidance in using consistent brand elements, as well as other ideas that improve the member and visitor experience. Doing research into the cost of each initiative to evaluate and compare the value and return on investment is a critical part of the plan. Knowing that these strategies are actually within budget helps to organize them into short, medium and long term initiatives, keeps them attainable, and doesn’t set expectations too high, especially for non-for-profits that depend on grants and funding! Don’t forget that people reading or utilizing the marketing plan as a guide may not know the gritty details of your current marketing situation or much about the ideas that you suggest, so it’s important to be very detailed in the explanation, using graphs, examples and pictures for easier digestion! In terms of actually using the marketing plan, it’s also important to determine methods of measuring success – whether it is increased visitors/sales, followers, or recognition of a brand – you need to make sure to know how you’re measuring whether your new methods are working or not! 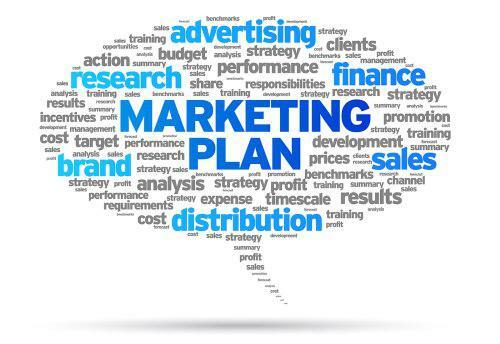 Well, I hope my mini-guide is able to help you out in either creating your own marketing plan or at least give you a little insight into what I was up to all summer. 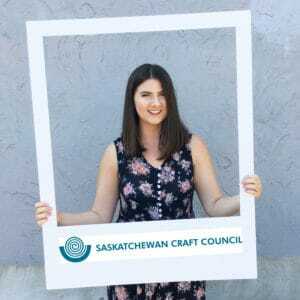 Brainstorming and discussing ideas with the other staff, board, and members also allowed some brilliant ideas to come about, so be sure to be open to sharing ideas, and make sure to keep an eye out for some new elements to get introduced soon at the Saskatchewan Craft Council!